Avoid damage from wash-downs with the IP55 Waterproof Hot Hole Punch and Control. As concerns about food and product safety increase, executives and line managers need to ensure comprehensive wash-downs do not compromise daily operations. Lako developed the IP55 Waterproof Hot Hole Punch for VFFS baggers to withstand wash-downs without having to be removed. 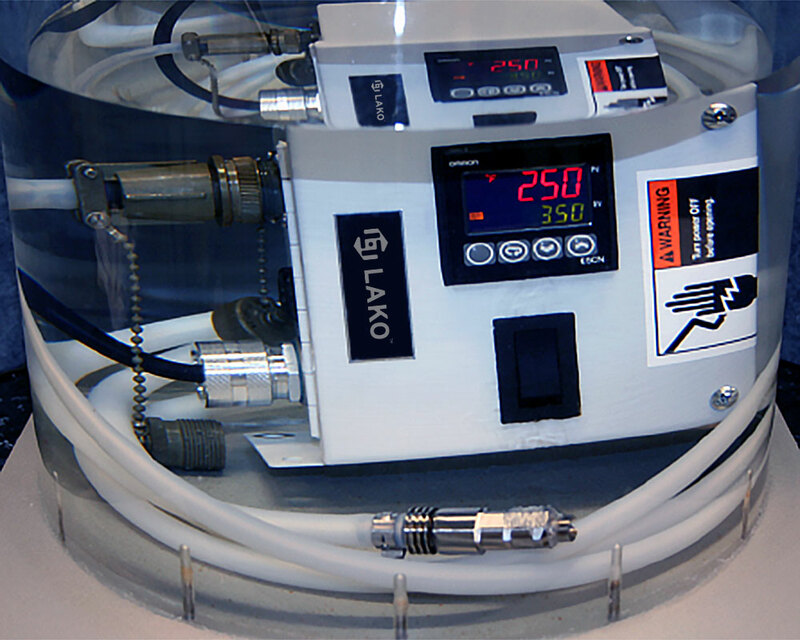 The IP55 is a version of the LAKO Hot Chamber Punch, designed to maintain the excellent benefits of hot hole punching in a wash-down environment. Totally sealed, IP55 waterproof system is designed to eliminate failures after preventative wash-downs. Avoid possible re-start delays due to removal and re-installation, electrical shorts due to water leakage, or other surprises. Compatible with most packaging machines. Click here to contact us for specific requirements. Rated IP55, NEMA 3 to protect from dust and water jets. Note IP55 Hot Hole Punch must be used with the IP55 Waterproof Control.